Want a fun way to enjoy your favorite music? Check out the cute Audiobot, maybe the portable speaker can meet your taste. 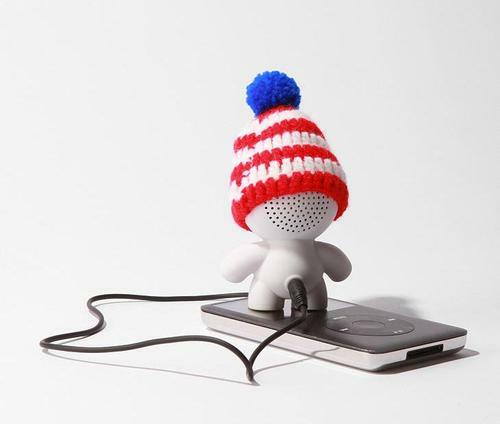 Similar with that Hello Kitty speaker, Audiobot is also a figure shaped mini speaker, which measures 3-inch tall, and comes with a striped knit beanie. The portable speaker features a built-in amp with 2,000 milliwatts to deliver you nice sound, while the integrated 3.5mm audio jack allows you to connect the speaker with various mobile music devices like MP3, smartphone, iPhone, iPod, and more. Apart from that, the built-in rechargeable battery provides you 4 hours of playback time after fully charged. Audiobot portable speaker is priced at $16 USD. If you’re interested, jump to Urban Outfitters for more details. Additionally, if you need more options, you might like to check deadmau5 portable speaker and more via “portable speaker” tag.